Peanut butter and chocolate. Trenchcoats and cyberpunk. Some great-tastes-that taste great-together are obvious. At first blush, the Tetris-and-Scrabble fusion that Puzzlejuice presents doesn't look like it's going to be appetizing at all. But, the indie iOS release winds up being one of the most delicious mash-ups ever. Puzzlejuice combines the falling-block puzzle gameplay of Alexey Pajitnov's classic with word-game mechanics of Boggle or Scrabble and the match-three mandate of Bejeweled. A familiar assortment of shapes descend from the top of the screen, broken up into different colors. When you fit blocks together and bind three colors adjacently, you can tap that section to generate letters. Multidirectional swiping along adjacent letters forms words. Creating a whole row turns all of those blocks into letters. The twist is that you'll need to clear the rows yourself. There's no automatic salvation as in the original Tetris. Further deepening the permutation are the power-ups you can earn. The bomb and freeze blocks do what you think, exploding blocks away and stopping time. There's a driller ability that shaves away the blocks in its path and a twister that levels out and resets the board. Challlenges and leveling fold into the cleverly spliced gameplay, daring you to make string together runs of four-letter words, for example. Of course, things get faster the better you do and you'll soon find yourself grasping for words as quickly as you can. All the snark in the menus and in-game prompts makes for a hilarious motivator, too. You don't realize how separate the parts of your brain that deal with spatial relationships and verbal skills are until you play Puzzlejuice. I've had many sessions where I've been so focused on squaring up blocks into columns that I've spaced out on making words. Or the opposite happens, and I'm so fixated on making bigger and bigger words that I let block fall into sloppy arrangements. However, one of the beautiful things about Puzzlejuice is how it lets you bail yourself out. Screw up a placement and you can still get a workable board by making a word and taking advantage of the shifting blocks that follow. Indie dev studio Colaboratory strike gold by taking two templates that seem diametrically opposed and weaving them together into an elegant system. Puzzlejuice demands that you constantly shift perception and create harmony between shapes, words, colors and speed. 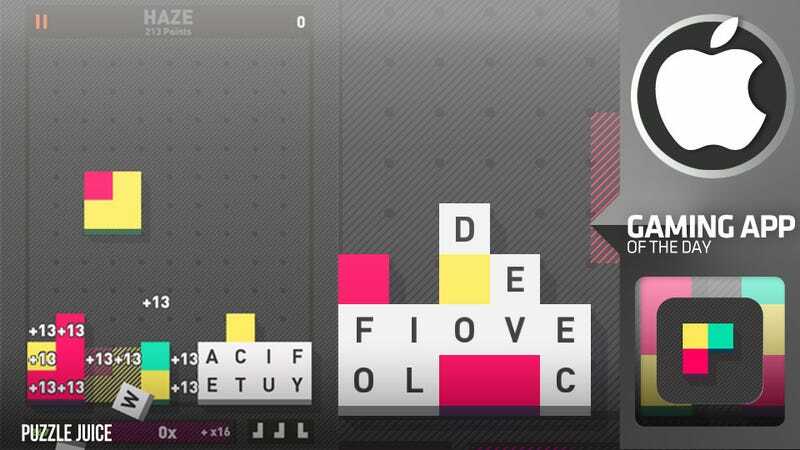 It's an inspired effort that will tickle puzzle fans, word-game addicts and aficionados of smart design. And it's only 99 cents as of this writing. Go get it now.